This scarf has been my constant companion for just over a month. It's travelled in trains and planes and visited friends in several countries, but needed local knitting group meetings to finish its journey. It's the Citron shawl pattern. Technically it's very simple. Lots of knitting front and back of each stitch to increase, and knitting two together to decrease. Lots of stocking stitch - and you're done. But despite its simplicity I think this is technically the worst piece of knitting I've done in a long time. 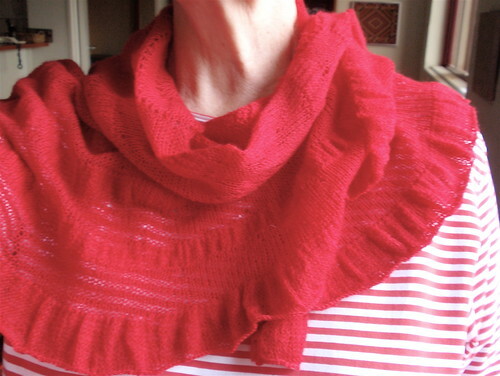 I've knitted it from a very fine Adriafil lace yarn I bought a year ago at the Wollongong knitting camp. Ravelry says it's a 1 ply cobweb yarn, and it certainly felt very fine. Because I was knitting it very loosely (to achieve lots of soft drape) every small unevenness in my knitting, every increased stitch, and every 'rescued' stitch when a stitch fell off a needle shows up in fine detail. But despite its imperfections I love it. 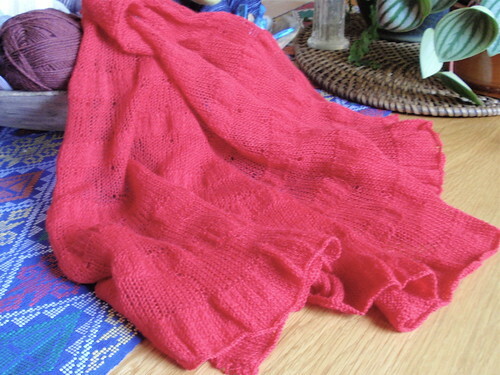 It's a perfect red colour (as always, impossible for me to photograph accurately) and it's soft and squashy to wear. It's the scarf equivalent of comfort food. You'll see me in it all winter. Following on rather tangentially from yesterday's post...I've been so pleased to discover this blog - sort of advanced Sartorialist for people who no longer care what the current fashion dictates. I have a long term interest in the way we all use language both to reflect and to shape the world around us. In choosing the words we use we not only let people know what we are thinking, but often also how we feel about what we are thinking. Just lately I've been concerned (yet again) by some words that are used among knitters. Those of you who know me can probably guess what's coming next - this is not something about which I've been silent in the past. I become very uncomfortable when people - particularly when knitters - use such terms as 'granny knitting' or 'nana knitting'. These are not neutral terms. They're invariably used to describe a style of knitting that the person using the term doesn't like and thinks is inferior. 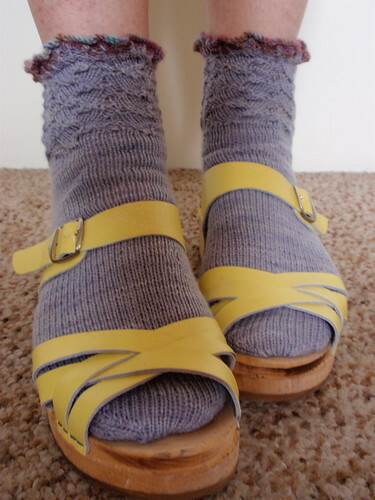 Such terms are a short-hand way of describing knitting that is some or all of the following - old-fashioned; unaware of what current fashions are; knitted from cheap and/or synthetic yarn; knitted in a colour or combination of colours that is unsubtle/unfashionable/generally unattractive; knitted to display technique regardless of style or attractiveness; unadventurous...I could go on, but I don't need to. We all have an idea of what the term encompasses. Of course, many of us find this kind of knitting unappealing and may wish to publicly judge it to be so. What I have difficulty with is that the words 'nana' or 'granny' are used as a summary of these characteristics. I don't need people to reassure me personally that I'm excluded from this category. I'm an older woman and a grandmother and I'm sufficiently confident of my taste or disregarding of others' judgments to knit what I choose and not care what others think about it. However, by associating a group of people (grandmothers) with a negative characteristic (unfashionable knitting) such phrases contribute to the unthinking devaluing of older women in our society. Well, I hope it's unthinking, because otherwise such language use is both unjustifiable and unjust. So, if you don't like a particular kind of knitting, please think about what it is that you don't like and find appropriate words to describe it - is it an inappropriate combination of yarn and style? is it mismatched technique and pattern? is it unfashionable? is it boring? do you just not like it? I can't imagine that the real reason some things are disparaged is just because they've been knitted by grandmothers. I've spent the weekend in Brisbane catching up with family. We also managed to squeeze in a visit to the Asia-Pacific Triennial of Contemporary Art at the wonderful Brisbane Gallery of Modern Art. I was keen to catch the exhibition before it closes on 5 April. After several weeks immersing myself in the riches of our Western heritage, visiting an exhibition that focuses on the diversity of contemporary artistic production from our Asian and Pacific neighbours reminded me of just how different the current cultural position of Australia is from that of Europe. 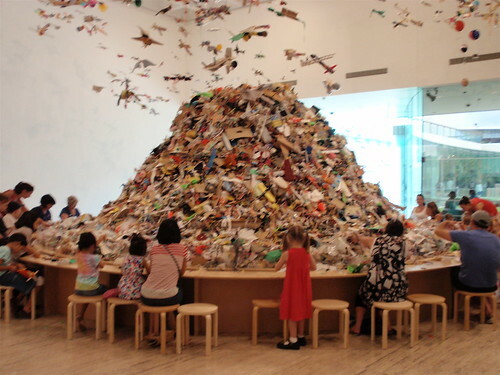 It's a mountain of scraps of paper, fabric, slivers of wood, cardboard, yarn and string from which people are encouraged to construct planes of various kinds. 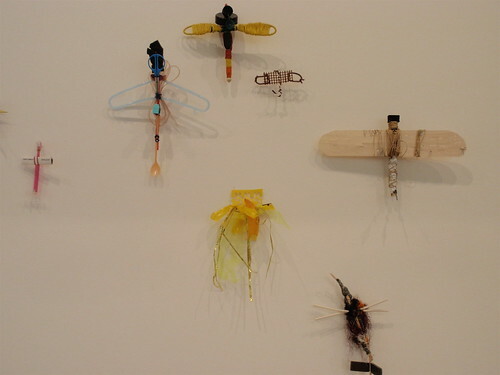 Hanging from the ceiling and attached to the walls are planes already made by the artists and community groups. Though it is 'about' the process of migration and being between cultures, it's sheer fun to watch people of all ages assembling their materials and constructing their planes. 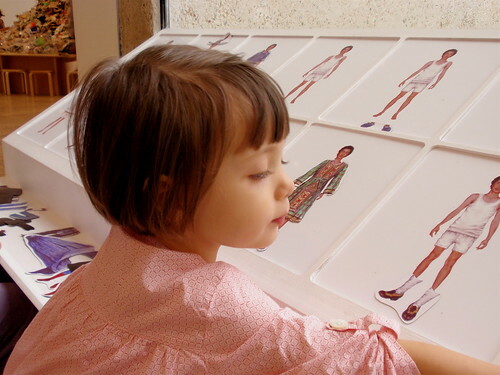 I also love another work that appealed to my deeply-held childhood passion for paper dolls. Pakistani artist Ayaz Jokhio created 99 self-portraits that you can dress in a myriad of garments - many of them mix and match elements of traditional costumes. The main part of the exhibition was busy and very buzzy. People pored over details of the exhibits and installations and there was much exclamation and laughter. 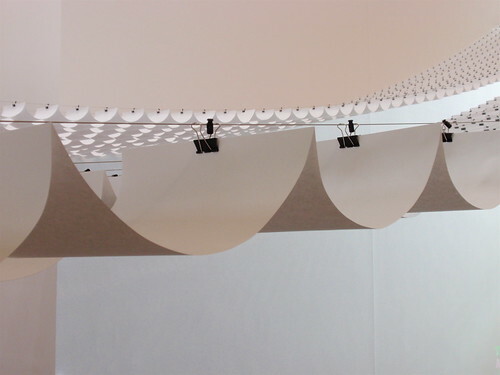 Some pieces were incorporated into the building, such as moving images of hands in the act of washing projected onto the basins in the washrooms, and the geometrically perfect canopy as you enter the exhibition that's constructed from innumerable loops of plain A4 paper connected with paper clips. 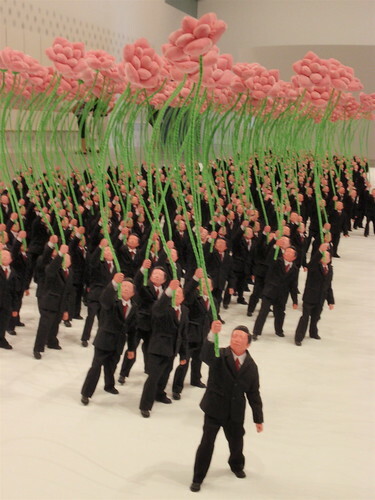 One of my favourite pieces has been used to publicise the exhibition - an installation of many small suited Chinese businessman figures clutching flag-like blooms. I imagine it must be a comment on the well-known injunction by Mao Zedong of 'Let a thousand flowers bloom' - such an appealing injunction with such disastrous outcomes. If you can get to Brisbane before 5 April, do go to see this exhibition. Alternatively, you can wait three years for the seventh installment of this engaging round-up of the artistic production of our region. It felt as if I'd come home. I started to write 'I didn't buy much yarn while I was away'...but you know what it's like with yarn...there's always more of it than you think there is. So, I'll revise my statement - I was very restrained in the yarn I bought while I was away. 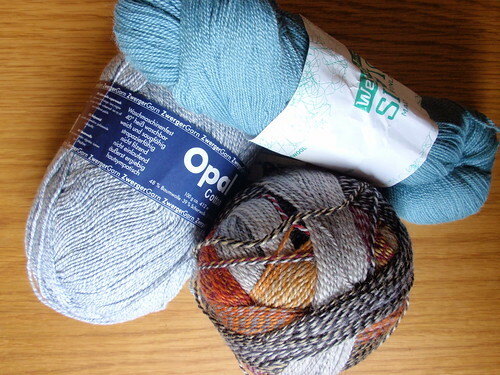 A skein of Opal sock yarn (in reality a wool/cotton/polyamid mix) in a light marl grey - I hope this is the same or similar to some yarn MissFee recently used for socks; a skein of Finnish Wetterhoff Silvia (a silk/wool laceweight whose dull greyish aqua colour was irresistible) and a fun Crazy Zauberball in grey, black and rust. 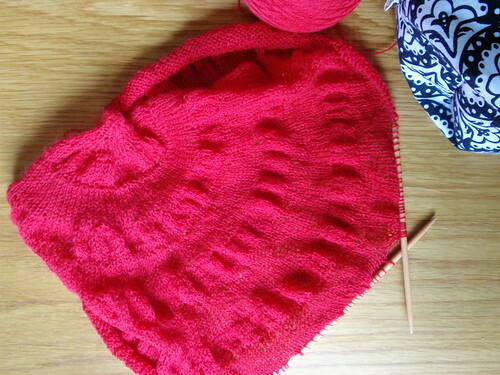 And I started the Citron shawl pattern in a very fine laceweight yarn in bright red. As everyone who knits this viral pattern comments, the rows become interminably long as the shawl grows. 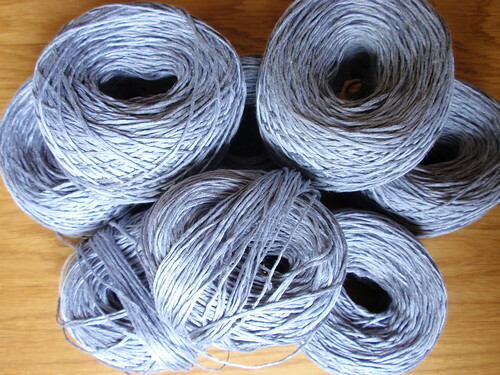 I bought the Adriafil yarn at the Wollongong Knitting Camp last year and discovered only after I'd started knitting that it's a particularly fine laceweight - Ravelry describes it as 'cobweb'. So, to make it large enough I'm going to add a couple of additional repeats to the pattern - I'm not brave enough to even imagine the number of stitches I'll have in each row. I did also knit a hat for the friend with whom I was travelling - a simple pattern I invented and that was very warm and looked good - unfortunately I have no photos. It's knitted from Cocoon - a beautifully soft Rowan 12 ply merino and mohair mix in a slatey deep mauve colour. But like many soft yarns it pilled almost as soon as it was knitted. I don't think I'd use Cocoon again. 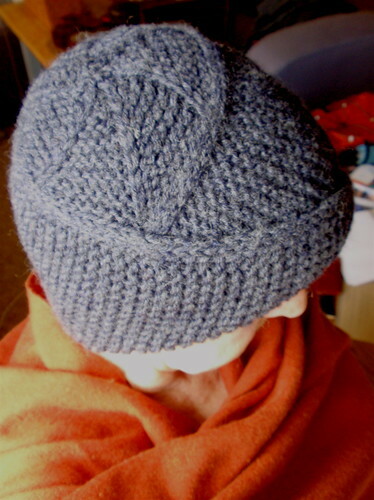 I finished this hat just before I left for my trip, and hardly had it off my head all the time I was away. It's Jared Flood's pattern 'Quincy' knitted from Bendigo Rustic and it's truly elegant - not in the sense of high fashion, but in the sense of finding a perfect solution to a design problem. I also love its slightly daggy cloche-like effect, and it's so warm and so comfortable. I want to knit more of them in a range of colours - though I'd probably have to visit somewhere colder than Sydney to wear them. So, my trip has come to an end with a few days in London. I'm not very good at London. 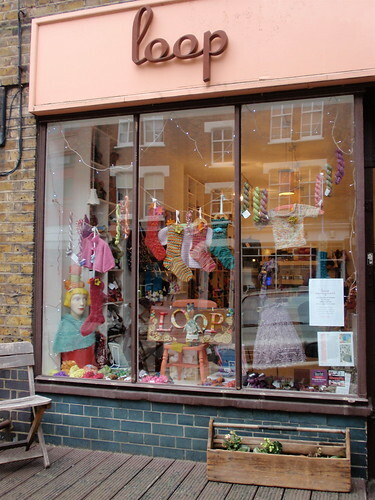 It's more than thirty-five years since my first visit to London, when I worked most awkwardly for several months as a shop assistant in the bridal department of a now-defunct department store. 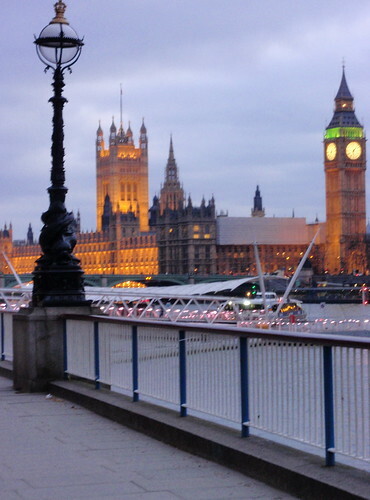 Though both London and I have changed greatly over those years, and though I've paid a number of visits in the interim, I still feel uncomfortable in London. I'm not really sure why this is. When I first visited in the 1970s, it had something to do with what I perceived as a condescending attitude to 'colonials', that developed a defensive, 'chip on the shoulder' attitude in me. But London has changed, and Australia as a colony is, if anything, only a distant memory for most of London's current, very multi-cultural inhabitants. 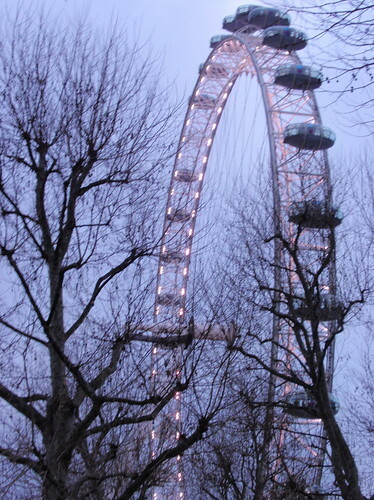 Now, I think any discomfort comes mainly from London being strange, but familiar at the same time. 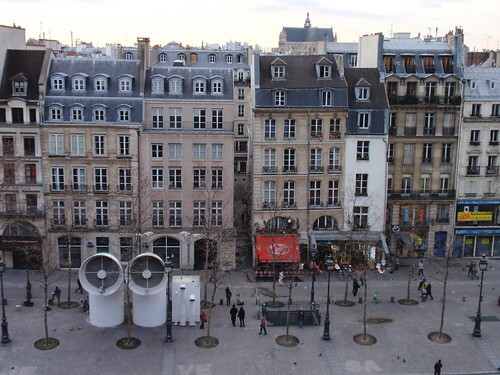 In Paris, partly because of language, I am unquestionably a 'foreigner'. My stranger role is well defined. In London, my role as foreigner is less obvious. Maybe my discomfort is just because my identity is unclear, and I don't cope well with lack of clarity. On this visit it was great to catch up with old friends. Both with friends from Australia, now living in London, and with a new friend made through Ravelry and blogging. With Jane, I visited the yarn shop I Knit in Waterloo. On the evening we were there the shop was crammed with more than thirty people all popping in to knit and chat together - very buzzy. The visit was on the last evening of my trip and I felt unable to cram anything else into my suitcase, so, reluctantly, I bought nothing. But Jane did direct my attention to some wonderful local yarns that I intend to follow up on-line - particularly Blacker Design yarns, and those by JC Rennie. I had earlier visited Loop in Islington. 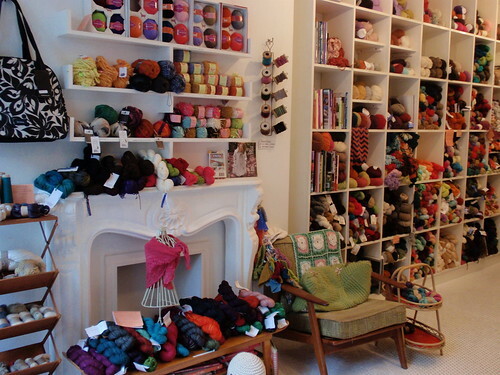 It's a cosy, welcoming shop with a very international selection of yarn. 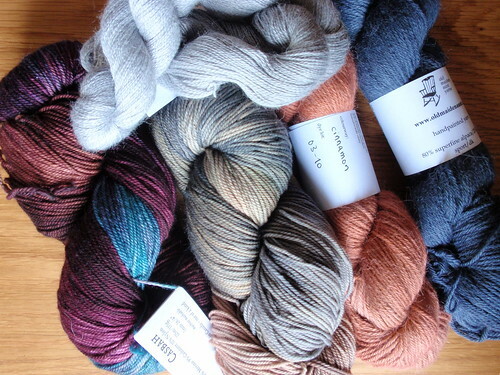 I particularly noted some lovely Canadian yarns I'd not seen before such as Hand Maiden's 'Casbah'. I did buy a little - but more of that in a later post. Otherwise? I think I'd really reached the end of my tourist oomph and just managed some old favourite haunts. The Victoria and Albert Museum, of course, though the recently magnificently revamped jewellery collection, which was one of my primary reasons for visiting, was closed due to a civil service dispute about redundancy provisions. After some grumpy reflection on why the jewellery in particular was a target for industrial action I clearly was able to find many other things to interest me. A rather quirky display that I now find very attractive (I used to be very dismissive of it) is the Cast Courts. These are two very large, very tall areas devoted to exquisite plaster casts of famous (and not so famous) sculptures from many lands. The collection was initially assembled in Victorian times as a teaching aid to demonstrate, at a time when travel was very expensive and less widely available, the characteristics and beauty of great sculpture. 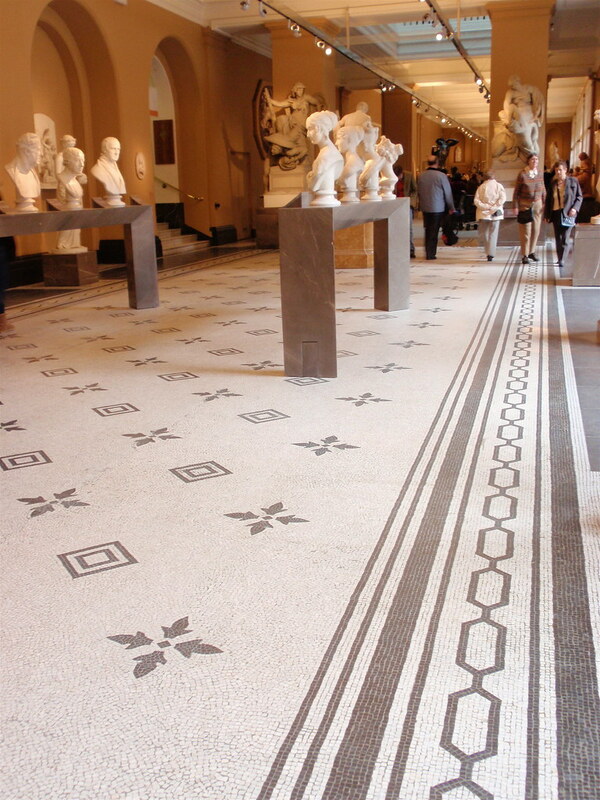 Over time, with the deterioration and sometimes even destruction of the objects of which casts were taken, it also provides pristine replicas of the original sculptures. With our modern passion for 'authenticity', copies and reproductions are not often valued, but perhaps such replicas - beautifully crafted objects in their own right - provide a solution to the issues of appropriation of material culture from other times and cultures. It's been a most interesting and satisfying holiday - and I think the pleasure has been increased through blogging. I've kept travel diaries before, but never quite so consistently, and never with such coordination of images and words. The blog's identity as a knitting blog has been eclipsed by the travel - but I'll try to remedy this in the next couple of days with an account of my very meagre knitting output over the last few weeks. I've been to Nottingham to visit Emily and Clare. I enjoyed catching up with all their news about jobs and Nottingham and knitting. It was great to see them both wearing knits that Emily had made during their year in Sydney - in a little more than a day I saw Clare in at least three different wonderful jumpers all made by Emily. And Clare's now spinning - beautifully! Then, of course, there's the new house. Work on the very major renovations are due to start in a week or two and they're hoping to move in by around August. The house has a great deal of charm, and it's much larger than I anticipated. 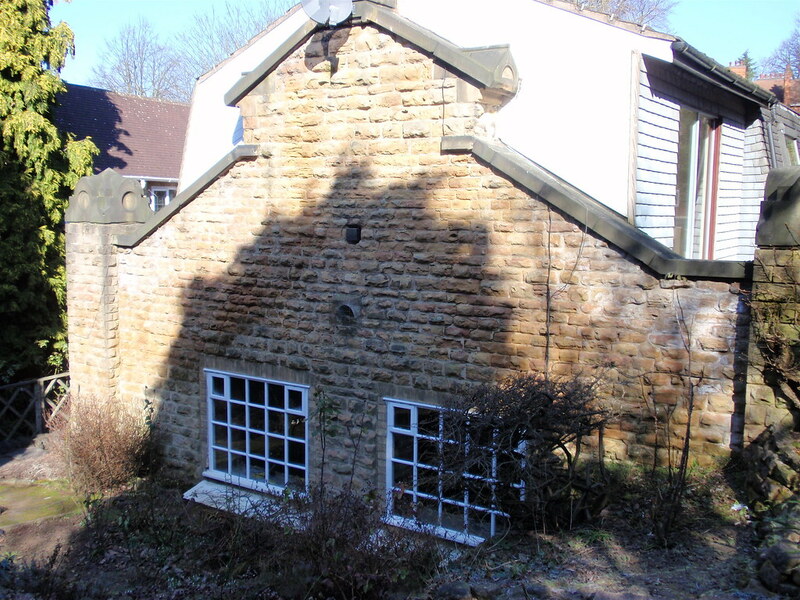 Originally it was a coach house for a great house nearby, but over time it's been converted to a house through a series of not so attractive and very environmentally unsound additions. Emily and Clare's changes will make it warmer, lighter, more open and more sustainable. A significant part of its charm is the worked stone from which the lower floor is built, and the wonderful stone fence that integrates the property with the neighbourhood. and yes, that is frost you can see surrounding the flowers. It was bitterly cold. 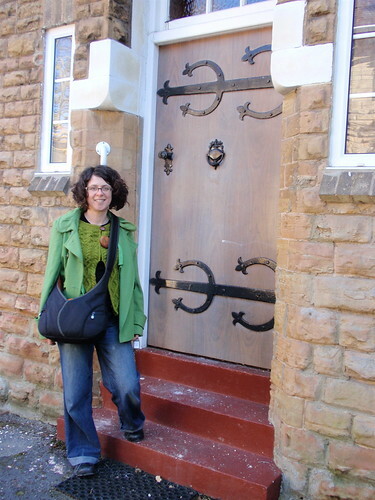 And here, proud and hopeful home owner Emily outside her current front door - soon to be replaced. Don't be deceived - that's really plywood behind those so olde iron hinges and door fittings. I'd never been to Nottingham before, and enjoyed my visit. It's the kind of middle-sized city of which I have little experience. I've lived in very small towns and villages, and very large cities, but nothing in between. 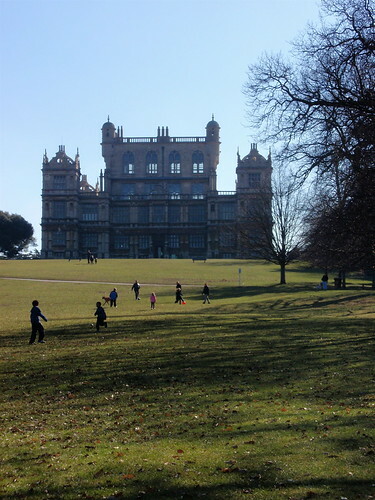 I suspect living in such cities, and Nottingham in particular - has a lot to recommend it - less traffic and consequently greater convenience than a large city like London, cheaper house prices, and a wide range of amenities and entertainment - galleries, plays, good cinemas, restaurants. 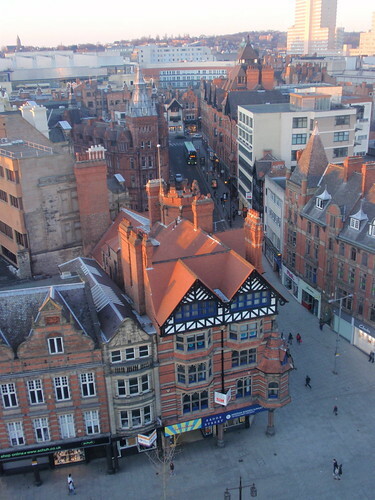 Nottingham also has two universities which I imagine adds to the vibrancy of its street life and entertainment. 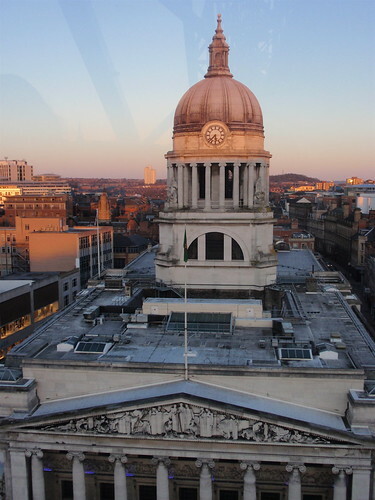 [If you're wondering how I achieved this photo, we rode on the big wheel, currently in Nottingham town centre, just before sunset. Wonderful views of the city and surrounds]. Another advantage of smaller cities is their relatively easy access to the countryside. 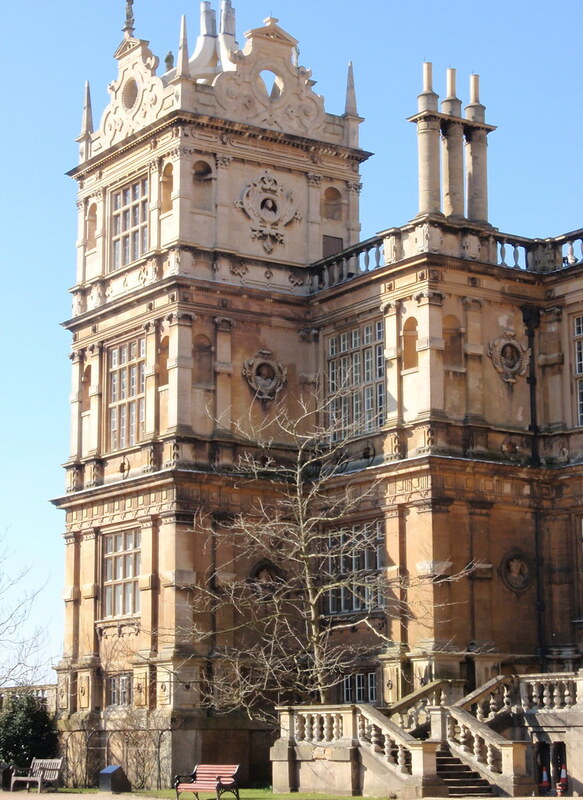 Emily and I visited Wollaton Hall just outside Nottingham. 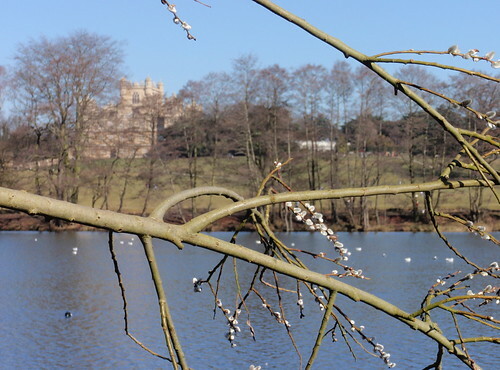 It was a brilliantly sunny Sunday, even though it was bone-chillingly cold, and there were lots of people walking through the grounds and around the nearby lake. The house dates from Elizabethan times and is now partly exhibited as an historic house, and partly as a charmingly old-fashioned natural history museum. It's the kind of museum that has lots of taxidermy of large animals (even a gorilla) and dioramas in glass cases of small animals and birds. The children (and adults) poring over the exhibits seemed to love it. 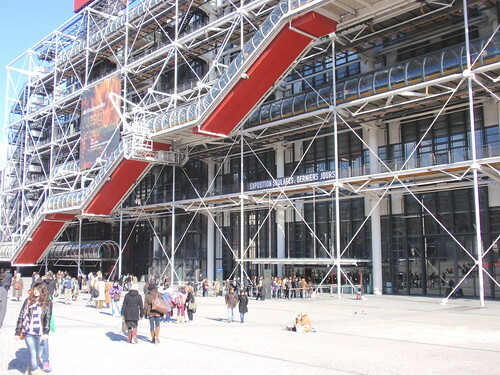 and the way that access to the various floors of the museum snakes diagonally across the exterior of the building. But such a shame. 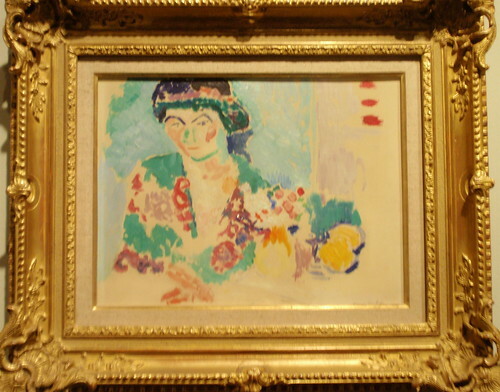 Today the great masters of modern French art were not on display - they are being rehung to show them to even greater effect to people who visit the museum after next week! We had to make do with a retrospective of the works of French painter Soulages (interesting, but no compensation for missing Matisse) and a rather confronting exhibition of women's art since about the 1960's. This was very uncomfortable - so much of it was angry, and many works had not really survived the context in which they were produced. 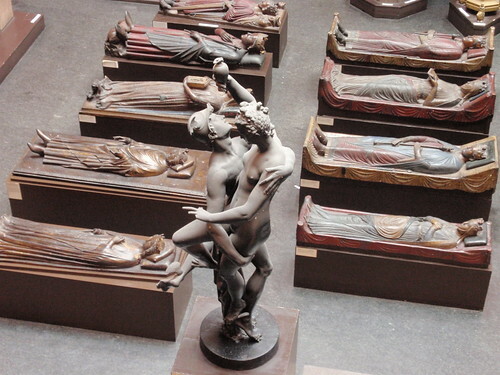 For me it was more effective as social history than as art, but even then it was too bombastic to stay for long. So, our visit to Paris is at an end. There's so much left undone, but I guess the positive side of that is that there are still many reasons for returning. I'm going to be brave. After more than two weeks in Paris, I'm going to list the best things - or at least the things that have given me most pleasure. 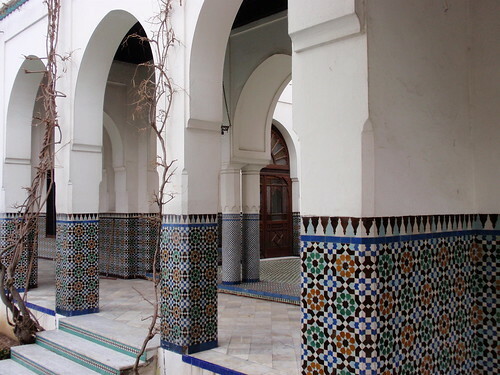 1 The Paris Mosque - for its beauty, its unexpectedness, and because it typifies the multicultural nature of Paris that is so often overlooked. The pleasures of visiting the Mosque are increased if you take time for a stroll through the food shops of nearby Rue Mouffetard. 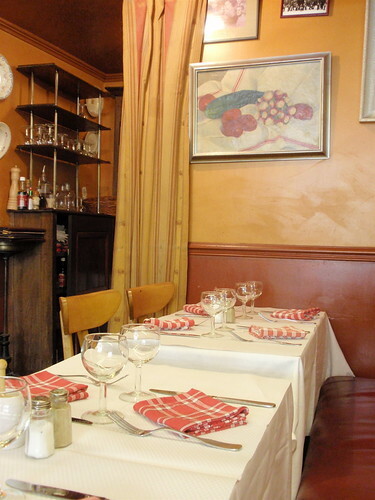 or the spicy tian of haricot beans, bacon and sausage served at the Corsican restaurant just around the corner. The Corsican restaurant, by the way, is the only place I've encountered on this trip where I've absolutely had to use my embarrassingly minimal French to get by. 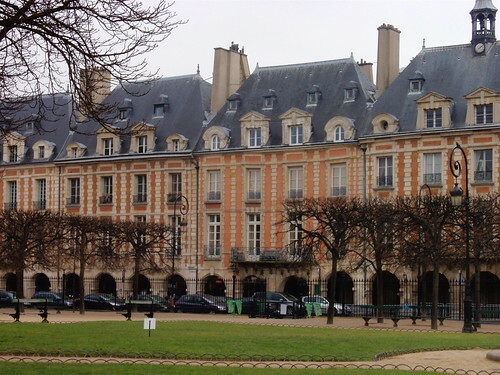 3 My old favourite, the Place des Vosges. What can I say? Perfect. Just the right scale, regular without being uniform, and clearly valued by the locals. I've been fortunate on this trip that it's often been on my way going elsewhere, so I've had lots of occasions to sigh in admiration. 4 The skyscrapers and La Grande Arche de La Defense I love their bold assertiveness. 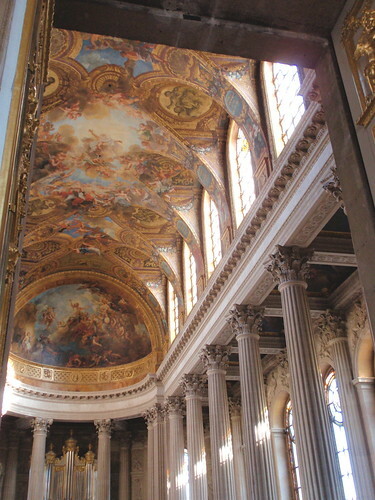 They compete with the grandeur of old Paris; they don't just give in to it. The buildings are diverse and imaginative and the scale is awe-inspiring. And there will be more skyscrapers in the future - part of President Sarkozy's grand projet is to make Paris 'more than a museum destination'. 5 The Promenade Plantee - the garden walkway that's been created on top of a disused railway viaduct in the twelfth arrondisement. 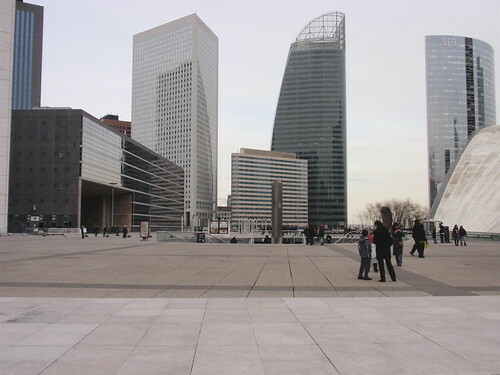 Again, my liking is largely a matter of the scale of the project, but, unlike La Defense's grandeur, I like the promenade plantee because its scale is so human. 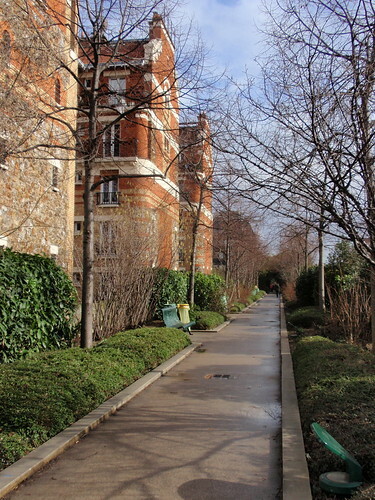 It's such a creative idea - using the old elevated railway tracks to build an extended garden walkway above the busyness of the streets below (the walkway in this photo passes by the windows of the fourth storey of the neighbouring apartments). 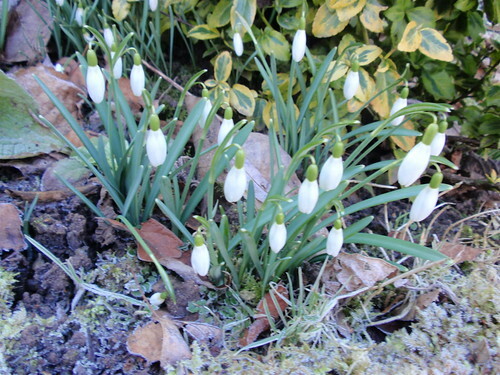 I want to come back in Spring when the bulbs are in bloom or in late Summer when the innumerable roses are flowering. Maybe an odd list. 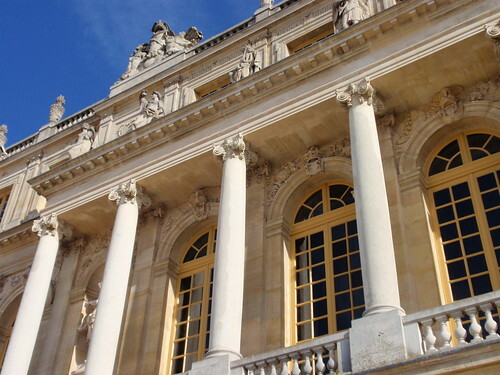 There's so much to do in Paris, and you'll visit the grands projets anyway. Some of these are not so grand, but they show Paris in its diversity and they gave me lots of pleasure. As a tourist, you inevitably spend time visiting the grands projets that some powerful figure from the past has decided should be constructed. 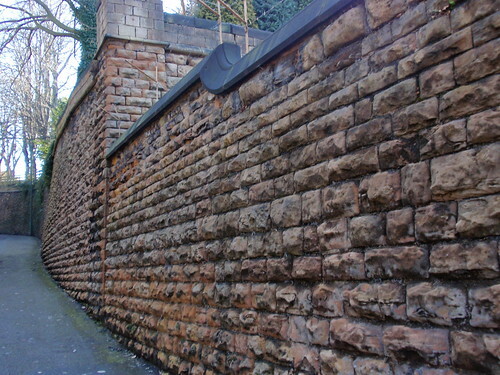 You know the kind of things I mean - often boldly designed public structures or buildings that aren't strictly necessary to our daily lives, that are usually hugely costly, that are often controversial, and that become much loved over time and emblematic of a city or town. 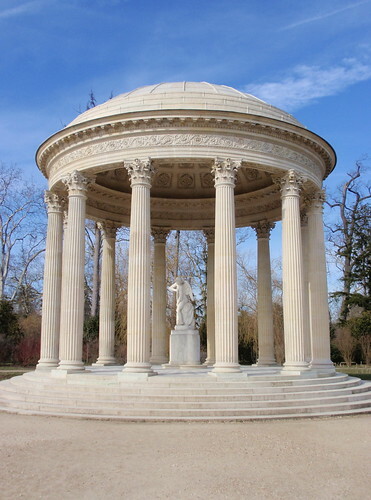 Sydney has its Opera House, but Paris has many such grands projets. Successive French presidents in the latter part of the twentieth century have added to the riches of Paris - though their undertakings were usually highly criticised at the time. 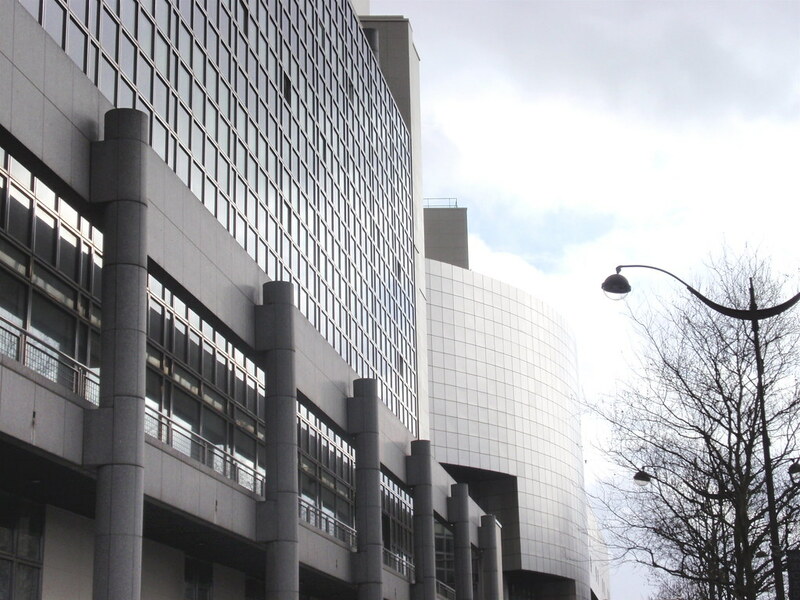 I've written about our visits to the Musee Quai Branly, a grand projet of President Chirac, and to the Louvre Pyramid and the Grande Arche of La Defense - both pet projects of President Mitterand. 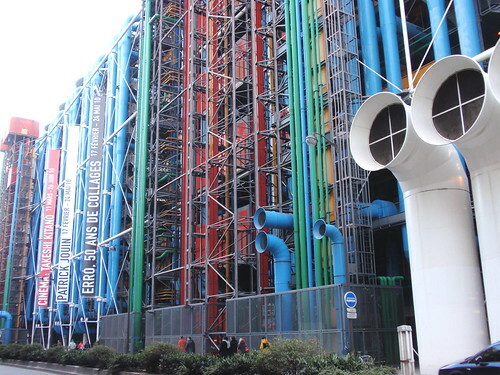 So far on this visit I've missed President Pompidou's Centre Pompidou (though I'm hoping to squeeze it into my last day - tomorrow). 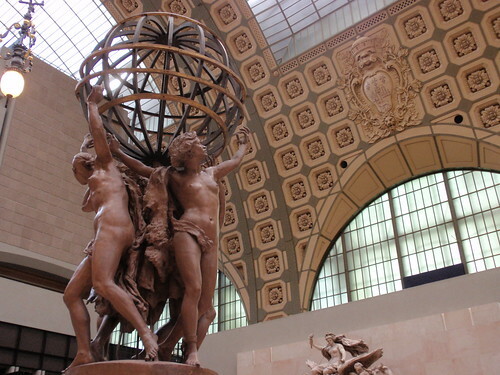 But we have visited another two of Mitterand's grands projets - the Bastille Opera House, and the Musee d'Orsay. Actually we've been passing the Opera House at the Bastille most days, as it's just along Rue Faubourg St Antoine from where we're staying. The Opera House is probably the least successful of these grand public works. 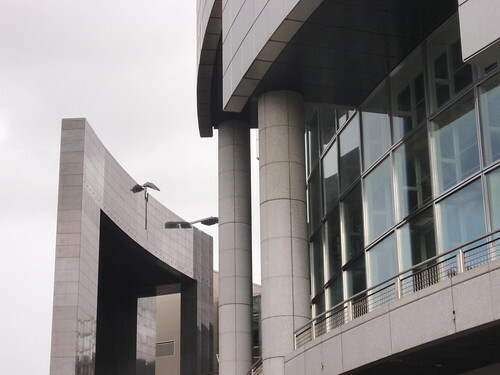 It's a very severe and imposing building, and Parisians haven't really come to love it as they have some of the other controversial constructions. It does little to enhance the Bastille square - though it's hard to imagine what would enhance the unplanned messiness of the Bastille space. But it works very well as an Opera House. We went to see an excellent production of Verdi's 'Don Carlo'. The stage is enormous, the orchestra pit spacious, and the acoustics are excellent. 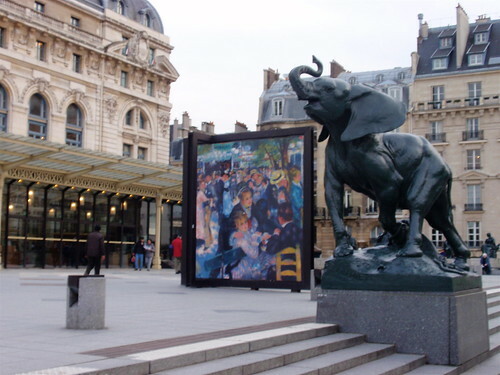 We dithered about going to the Musee D'Orsay, knowing that it was undergoing significant renovations and that many of the impressionist and post-impressionist masterpieces were touring the world (including the ANG in Canberra) while their home is being renewed. We needn't have worried. 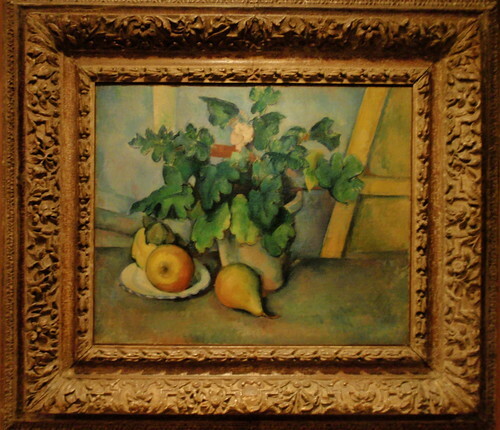 There was more than enough to see before our eyes and heads were too full of images to take in any more - rooms of Monet, Pisarro and Sisley, lots of Renoir, significant representation of Gauguin and Van Gogh, and enough beautiful Cezannes to particularly satisfy me. 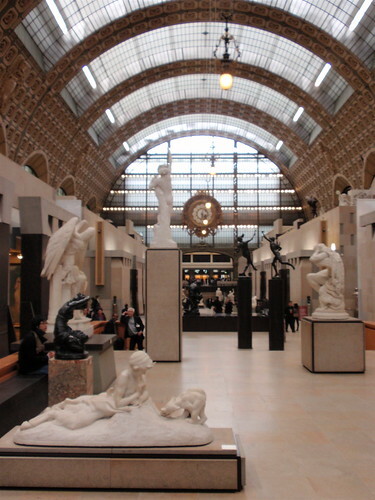 Anyway, with the Musee d'Orsay part of the pleasure is the building - Gai Aulenti's 1980s transformation of a 1900 Art Deco style railway station into a gallery that is itself a work of art. I've never before visited Versailles, and I'm very pleased we did so today, though even in wintry March it was inundated with visitors. 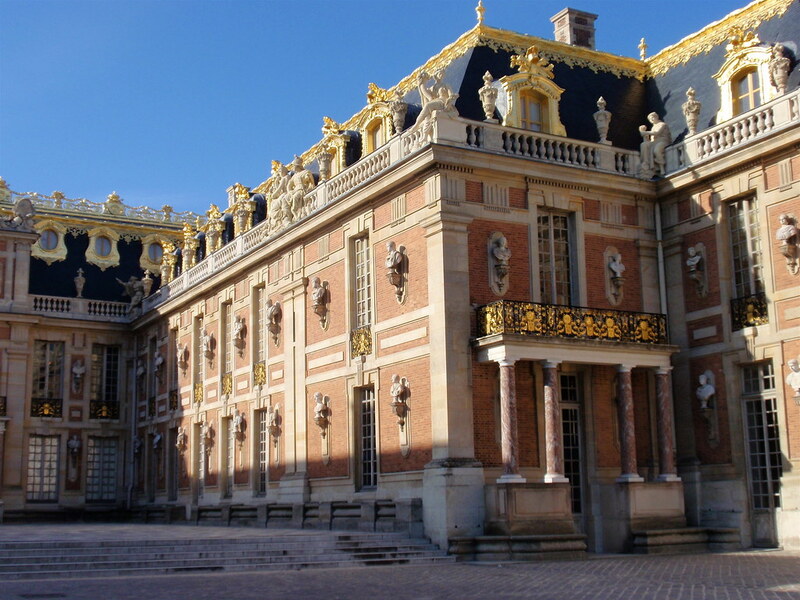 The Chateau itself was transformed from a hunting lodge by Louis XIV in the mid-seventeenth century. 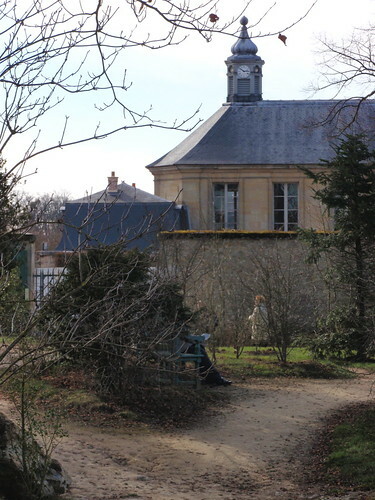 It was added to over centuries, in danger of demolition after the French revolution, and rescued by Louis-Philippe in the 1830s. It is ostentatious, sumptuous and all together just too much. The Hall of Mirrors, flooded with natural light on a wonderfully sunny day, was undoubtedly the highlight. 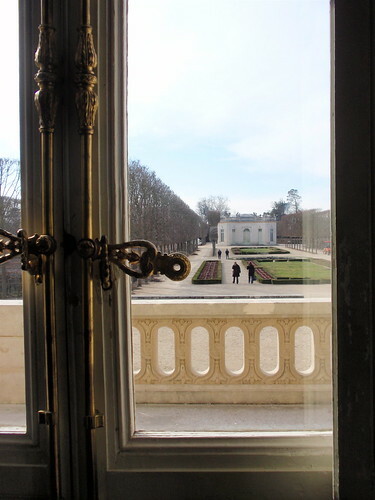 We chugged around the vast gardens to the Grand Trianon and the Petit Trianon on a petit train - a sensible way to see everything without wilting from exhaustion. 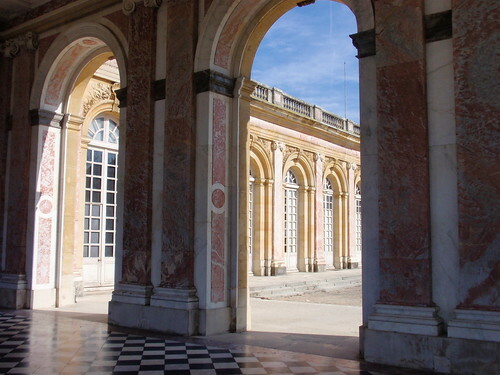 The two smaller chateaux, with their echoes of Louis XIV's children, of Marie-Antoinette playing milkmaid, and of Napoleon and Josephine are on a more human scale - though still grand and with beautiful vistas of the gardens and their delights. An extremely grand grand projet. 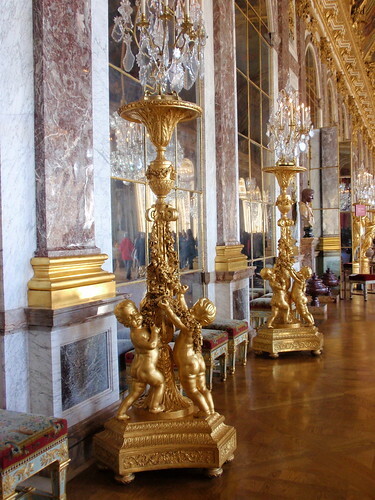 But one visit to Versailles in a lifetime is quite enough grandeur for me.